This course includes a home study component that serves as a prerequisite to the live activity. To review the full activity description of the home study component click here. To access your home study, click on the Register tab above, choose the specific location & date that you are enrolled in and then click the “Take Course” button in the Course Summary box on the "Overview" tab. The roles that hormones play in body physiology and pathology are intricate, complex, and multifaceted. These communicatory molecules are central players in the maintenance and regulation of multi-organ systems and functions, including digestion, metabolism, sexual reproduction, lactation, growth, development, sleep, and stress, among much more. Hormonal actions are specific as well as interactive and diverse. With their critical roles in whole-body homeostatic maintenance, even the most subtle deviation in hormonal levels has the potential to produce vast multi-system changes that can clinically emerge as a variety of symptoms. To further complex the matter of hormonal systems, there exists substantial variations in individual hormone levels required for maintaining individual set-points. What may be normal for one, may be abnormal for another. This program will allow healthcare providers from various backgrounds, pharmacists, physicians, and naturopathic doctors among others, with the unique opportunity to collaborate together to produce a patient-centered treatment regimen based on concepts and evidence discussed in this activity. Participants will be presented with clinical evidence on the benefits and risks of hormone restoration therapy and how it can be optimally applied. All course material will be put to practice through interactive case studies that involve assessing patient clinical profiles and devising appropriate and customized therapeutic solutions. Well put-together seminars on hormones. The facilitators approach hormones from a truly holistic perspective, incorporating natural supplements, nutraceuticals, diet, and vitamins along with hormones to achieve the best results for the patient. I have attended numerous other hormone/BHRT conferences and LP3 Network’s is by far the best I've seen. I have never seen such a well-laid-out conference with defined learning goals and a start-to-finish approach with concrete examples and working plans. I highly recommended my Naturopathic Doctor colleagues and pharmacists to attend. Taking the Hormone Management course has radically changed and enhanced my pharmacy practice. I am a prescribing pharmacist and I have created positive relationships with physicians who refer their patients to me for review and recommendations on oral and transdermal preparations. I provide the physician with a report of my recommendations and also create an individualized preparation for the patient. The patient will return to my pharmacy for follow-up and possible adjustments. My network of referring physicians is growing and based on success, so are recommendations. Most of my patients are women going through menopause and difficult times in their lives. This program helped me understand how the entire endocrine system is involved in the process of menopause, and not just the ovaries. I am able to explain the patient's symptoms better and prescribe more efficiently. The program enhanced my knowledge of hormone compounding and made me confident to prescribe compounded HRT. Thank you so much for the seminar, it was wonderful. I've now taken 5 weekend-long hormone conferences since getting licensed to prescribe and this was the best one. Very clinically relevant and integrative, I enjoyed working through the cases with the other practitioners and the pharmacists at my table. I look forward to doing more hormonal work with the new information. After attending the seminar, I am better able to advise prescribers on routes of delivery, methods of testing and follow-up care. I am also better able to explain therapeutic options to patients, for both medical prescription products and supplements. It was also a good opportunity to network with local practitioners and to work together in groups, which was very nice! Pharmacists, Physicians, Naturopathic Doctors, and other healthcare providers engaged in hormone restoration therapy. The live activity workbook is copyright © 2012-2018 LP3 Network. Evaluate and apply a unique set of rules applicable to customized hormone restoration therapy. Analyze physiological and biochemical features of endocrine system dysfunctions. Describe the hormone cascade, its neurobiological communication network, effects of exogenous and endogenous factors on the cascade, and impact on endocrine and neighboring digestive and immune systems. Investigate and evaluate therapeutic alternatives for specific classifications related to hormone therapy and imbalance; specifically construct formulations, which may be prescribed or used by a healthcare provider in the treatment of perimenopause, menopause, andropause, thyroid dysfunction, adrenal dysfunction, metabolic syndrome, and sexual dysfunction. Interpret, integrate, and evaluate comprehensive patient assessment chart data, including prior medical history, familial history, differential diagnoses, lifestyle behaviors, signs and symptoms, and laboratory test results. Describe and design hormone-related medication options, adjunct pharmacotherapeutics, and nutraceutical treatments that are optimal and efficacious for the individual patient. 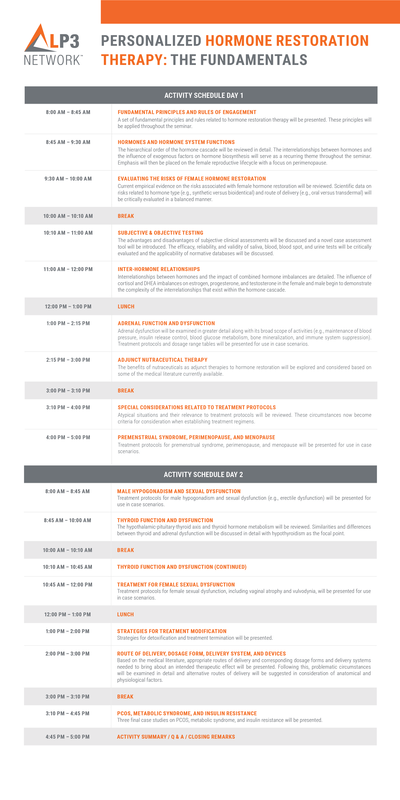 Recognize and evaluate the various routes of delivery, delivery systems, dosage forms, and dispensing mechanisms used in hormone therapy, adjunct therapy, nutraceutical supplementation, and specific aspects of lifestyle management; and monitor patient responses through quantitative and qualitative systematic testing. Interpret the hormone cascade and the impact of exogenous and endogenous factors on other endocrine axes and neighboring digestive and immune systems. Evaluate the clinical evidence describing the risks and benefits of hormone restoration therapy, including the use of synthetic versus bioidentical hormones and various routes of delivery. Recognize critical indicators from patient biological assays, signs and symptoms that aid in the identification and diagnosis of hormonal conditions. Utilize empirical evidence to support personalized and tailored approaches for the treatment of perimenopause, menopause, andropause, thyroid dysfunctions, adrenal dysfunctions, metabolic syndrome, PCOS, and sexual dysfunction. Dr. Tara Scott graduated from Northeast Ohio University College of Medicine and completed her residency with Summa Health Systems at Akron City Hospital in Ohio. She recently retired from OB/GYN after almost 20 years to focus on functional and integrative medicine. She is a Clinical Associate Professor at Northeast Ohio Medical University, where she teaches residents and is involved in clinical research. Dr. Scott is a certified menopause practitioner with the North American Menopause Society and a fellow of the American College of Obstetrics and Gynecology. She first became involved with hormone and integrative medicine while practicing as an OB/GYN. Her empathy for patients experiencing hormone-related issues led her to become trained as an advanced fellow and certified by the American Academy of Anti-Aging Medicine. The evidence-based practices she employed helped many patients conquer chronic wellness issues. She then started Revitalize Medical Group, where she serves as the Chief Medical Officer. In 2016, she obtained an additional board certification in Integrative Medicine. Recently, Dr. Scott was appointed as Medical Director for Summa Health in Akron, Ohio, where she will develop and run an Integrative Medicine program. Dr. Scott is passionate about educating the medical community on the advances in evidence-based hormone therapy. She lectures around the community to raise awareness about wellness and hormone balance. Dr. Ken Speidel is recognized for his broad experience in pharmacy practice and education, including his national recognition as a pharmacotherapeutic specialist in endocrinology and pain management. In addition, Dr. Speidel provides expert training in sterile and non-sterile compounding processes in the acute care, community, outpatient, and 503A/503B practice sectors. He has been instrumental in the development of national standards for pharmacy compounding practices and provides consulting services to many organizations, including boards of pharmacy as well as hospitals and health systems in the United States and abroad. This program is accredited by the Accreditation Council for Pharmacy Education (ACPE) through CPE Consultants, LLC. Complete home study learning assessment with a score of 70% and submit a completed home study evaluation online. Attend the live activity in full (sign-in and sign-out on each day) and demonstrate satisfactory participation. Participants registered in the United States will obtain a statement of completed credits on their NABP e-Profile within 60 days. Participants registered in Canada and elsewhere will receive a statement of completion by email within 60 days. All participants will receive an automated email from LP3 Network advising participants that they can download the LP3 Network certificate. 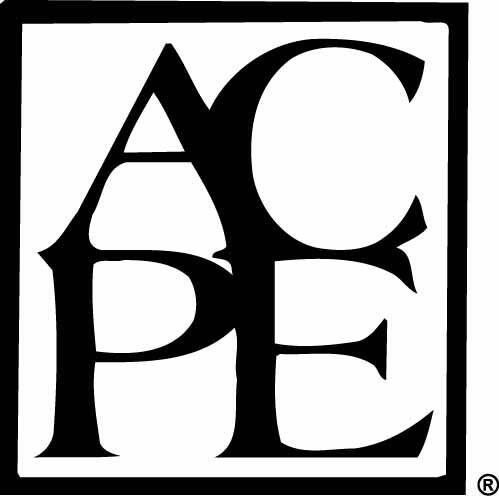 CPE Consultants, LLC is accredited by the Accreditation Council for Pharmacy Education as a provider of continuing pharmacy education and complies with the Accreditation Standards for continuing education activities. FCM designates this educational activity for a maximum of 16 AMA PRA Category 1 Credits™ . Physicians should only claim credit commensurate with the extent of their participation in this activity. Completion of home study is not required to receive credits. It is the participant’s responsibility to contact LP3 Network to bypass the online home study (required by default). This program is accredited by the American Association of Naturopathic Physicians (AANP). Submit a completed live activity evaluation form online. Participants will receive an AANP certificate of completion. Participants will also receive an automated email from LP3 Network advising participants that they can download the LP3 Network certificate. Completion of home study is not required to receive Category A credits. It is the participant’s responsibility to contact LP3 Network to bypass the online home study (required by default). When the aforementioned steps have been completed and approved, participants will be sent an email in approximately 10 days to access their Category A Credit certificate online. It is the participant’s responsibility to submit the certificate to CONO to claim credits. A maximum of 10 Category F CE Hours can be claimed every 2 years. Therefore, completion of home study is optional*. It is the participant’s responsibility to contact LP3 Network to bypass the online home study (required by default). When the aforementioned steps have been completed and approved, participants will be sent an email in approximately 10 days to access their Contact Hours certificate online. It is the participant’s responsibility to submit the certificate through CNPBC’s Registrant Online Self-Service system to report CE hours. *Additional CE hours accrued from live activity of from home study (if completed) can be applied to other continuing education categories, as appropriate.